A small pamphlet in an old book on breathing—tucked away for a moment, yet hidden for a century in the dark, slips into my hand; bright, strong and smooth to the touch. It's a fine example of a circular, which now arrives in the form of an email. Four books are given their due in this English advertisement. 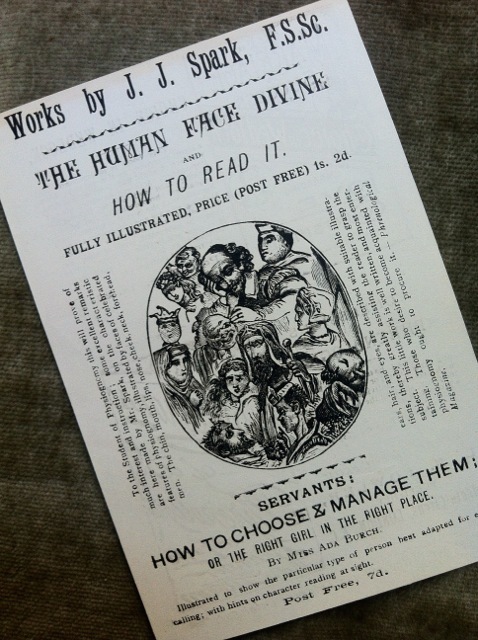 One concerns itself with reading the human face, while another deals with choosing and managing your servants—which was undoubtedly meant for the upper middle classes. 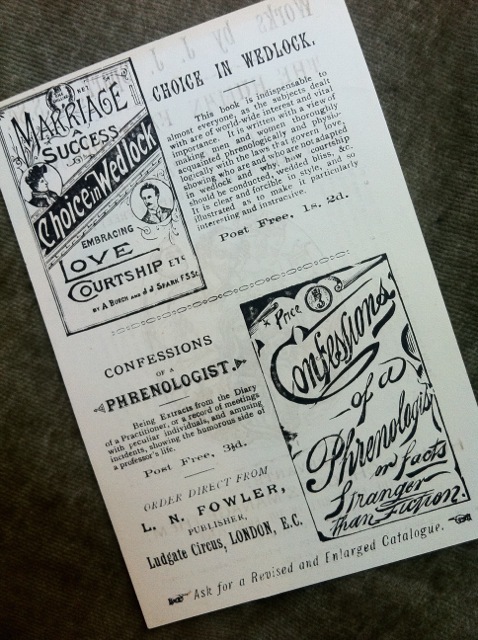 Turning it over, one finds a book on success in marriage, still a hot topic, while the most interesting one—at least to these eyes anyway, is a title called "Confessions of a Phrenologist: or Facts Stranger Than Fiction." Wondering if it is floating around somewhere, I take a minute to conduct a search at Google Books and come up empty-handed. Of course it's out there somewhere: one just has to dig a little deeper. It's not the first time I have come across the subject of phrenology, which occupied the minds of singers and voice teachers in the 19th century along with everyone else. (While not at my fingertips, I know of a book which contains learned opinions on the larynx by many well-known American voice teachers which was published by a phrenological society in the 1890's. In fact, I believe I've already referenced it on these pages.) Now considered a pseudo-science and an "important historical advance toward neuropsychology," phrenology is an ancestor to the "body-mind" research which occupies the attention of voice professionals today. Open a journal and you will find all manner of articles on brain function and neuroplasticity, which often include nifty color-coded images.